Home / News / Peeling Paint? ARRRRGH!!! Fix it WITHOUT scraping! I learned a lesson about primer the hard way in our kitchen and bathroom when I painted. DO IT! Even when you don’t think you need to! But if you forget, I found a solution. 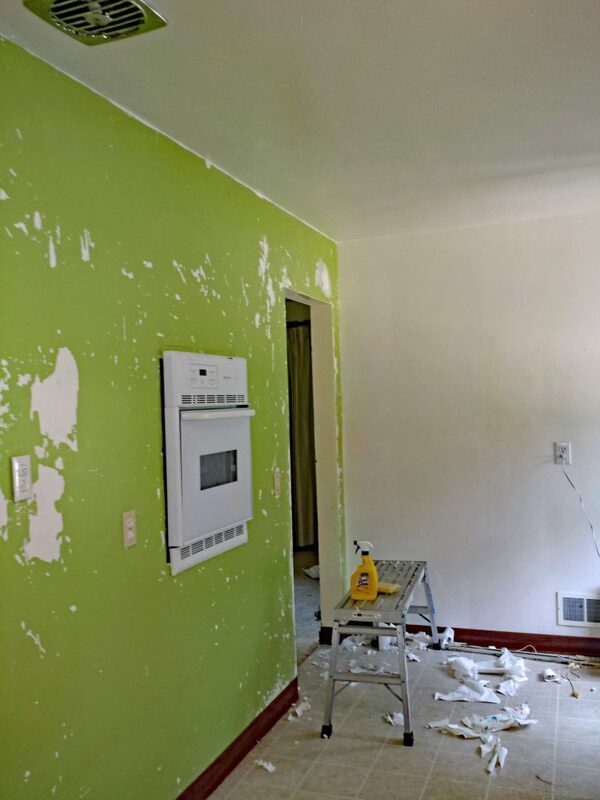 I skipped using a separate primer in both the bathroom and kitchen because the paint was in good condition, and I was using a paint with primer in it. The peeling paint in our bathroom. Normally, this means removing all the paint and starting over. Since I didn’t prime, I ended up paint that just pulled off the wall like plastic wrap off a glass bowl… The paint just peeled off the walls. It was awful!!!! 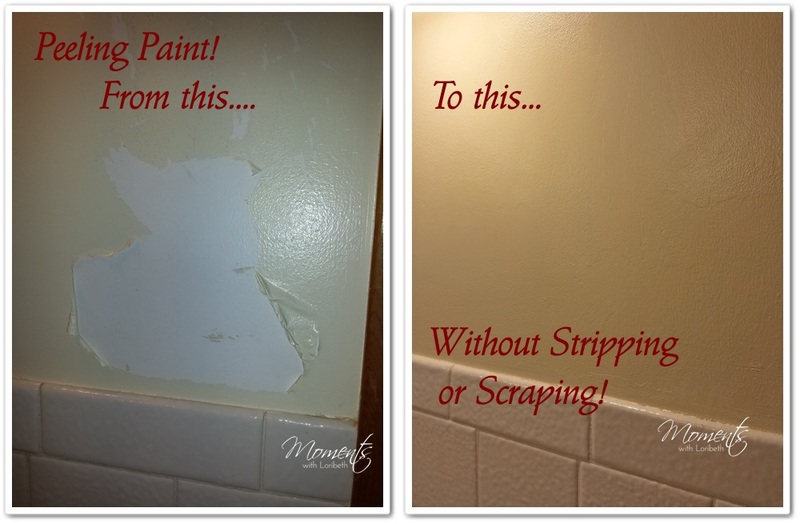 After spending a whole day painting the bathroom and kitchen, Jim and I had to spend about an hour the next day peeling it off the kitchen walls because it wasn’t sticking. Since the bathroom was too small for us to both work in, I had to do that room by myself. After an hour of picking at it with some parts coming off easily and other parts refusing to come off, I gave up. Two weeks later, I tried again, kind of hoping the paint had cured, and I wouldn’t have to deal with it… No such luck. In some spots it peeled off easily and other parts it wouldn’t budge. When I tried sanding it smooth, the paint just gummed up the sandpaper. I knew I was facing having to use paint stripper if I wanted nice smooth walls with no peeling paint. I honestly did not want to use stripper, because I knew it would be extremely messy. 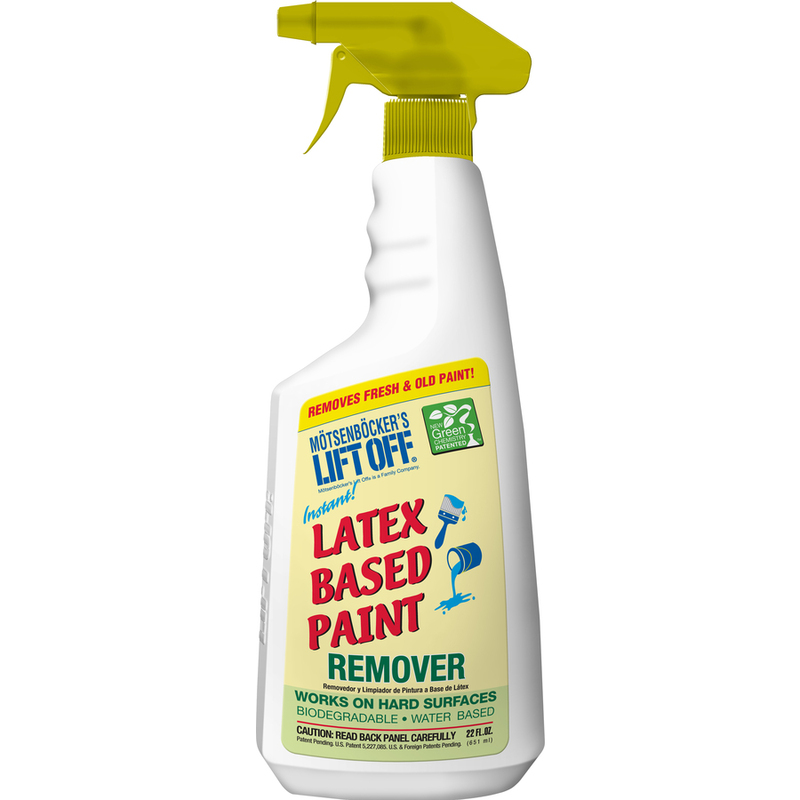 In desperation, I tried spraying Motsenbocker’s Lift Off Latex Paint Remover on the wall above the shower. I had used it to clean up painting goofs on the trim in the two small bedrooms, and it had worked great for that. It didn’t smell bad, it wasn’t messy, and was easy to use. So, I kept my fingers crossed that it would work this time. IT DIDN’T WORK!!! The paint wasn’t coming off any easier. ARRRRGH!!! If anything, it was making it worse–probably because there was so much paint that needed to be removed, rather than just little goofs. Defeated, I gave up, and decided to work on it again when I had more energy. It was two whole months before I was ready to face the bathroom paint debacle again. Hoping that maybe the paint had cured enough that I wouldn’t have to remove it I tried scraping it where I had sprayed the Latex Based Paint Remover. It did NOT scratch off! I was so excited! Then I tried scratching where I hadn’t sprayed it. I wasn’t so lucky, the paint scratched off. That’s when I got an idea… Maybe this stuff bonded the paint to the original paint when it dried. So I took a chance, sprayed all the painted walls, and then I left it to dry. Two days later, all the paint was bonded and no longer scraped or peeled off!!! Just to make sure I hadn’t missed any spots, I sprayed all the walls again. Two days later, I used sandpaper to smooth out any rough spots, washed the walls, primed, and painted. Here you can see how bad the paint was peeling on the left. On the right you can see how it looked after using the spray. I should point out that the way I used this product is NOT the way it is advertised to be used. I used it in a way that it is not intended to be used at all. However, it did save me a lot of work. I don’t know if it will work as I used it on all surfaces or with all paints. 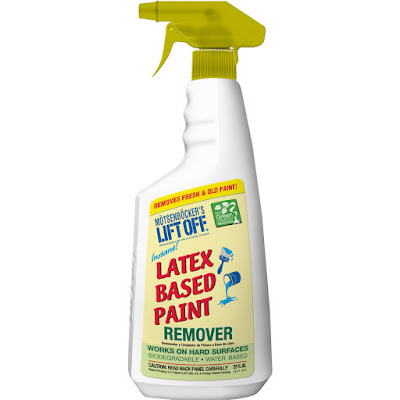 Since it is formulated for latex paint, I don’t think I’d try it with oil based paints. I can’t guarantee it will work in every situation where the paint isn’t sticking. But for me, the paint job was already ruined, so I thought it was worth the risk. Fortunately, it worked! And because it was so easy, if I run into an issue with peeling paint again, I’ll probably try this first, before I try anything else. As the saying goes, “an ounce of prevention…” Always prime if you don’t know what kind of paint is on the wall. 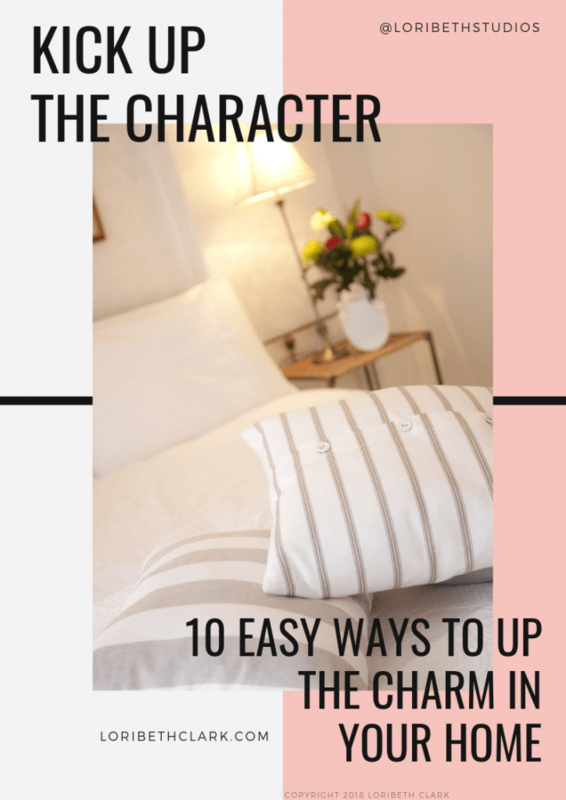 But if you find yourself in this situation, this trick might work for you too. Hey! If you have had an experience with peeling paint please share it. Misery loves company!!! hehe! Hi Wendi, Thanks for the tip! I've that before, and I completely forgot about it. I'll tell this, next time I will be testing! Thank you!! !